This is a children's picture book edition of the best-selling adult book of the same title. Using illustrations and age-appropriate text, this children's edition features passages of scripture along with original text to tell the Easter story and provides ideas for family traditions that young children can understand to make the holiday more Christ-centered. Each spread uses at least one person from the Easter story—including Simon, Joseph and Nicodemus, Mary Magdalene, the disciples on the road to Emmaus, and Thomas—to illustrate a theme. I have been reading this book with my kids each night this week, and we love it. It is simple enough that my 6-year-olds can understand it, while still being interesting enough to engage my older kids as well. Each day has scriptures to read, then the next page tells the story of what you just read, ending with a challenge or a question for you to answer. I love that this helps my kids (and me!) focus on the actual reason we celebrate Easter, instead of just getting ready for the Easter bunny. Not gonna lie, in years past, I have been guilty of doing just that. I like that this book is simple and easy to do. I usually don't have a lot of patience left by bedtime each night (something else I need to work on) but this book is easy enough that I have no problem taking the time to read it with my kids. Win-win situation for all of us! Our family is using this book for scripture study at night this week. My kids love the activities suggested at the end of each day. I love that not only does it bring in scripture, but then it tells it again in story form, always asking a question about how you can bring that day's "lesson" into your own life. I love when scriptures can be applied to life, and I love that the application is something every member of my family can do for themselves. We don't always have time (or energy...let's be honest...I'm normally way past ready for bed when we do this) for the activity, so I love that the question is there as well. It gets us talking and discussing things as a family. This is extremely important to me right now since I asked my five year old why we celebrate Easter and she responded, "For the candy!" That was not my proudest mommy moment. Hopefully by the time Easter rolls around on Sunday she will have a firmer grasp on the real reason we celebrate Easter. 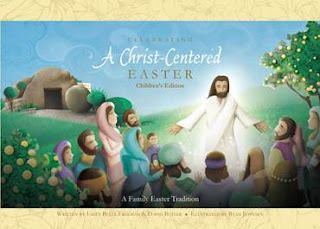 This is a lovely book I can see us pulling out year after year to celebrate this Holy Week.